This past two weeks, nearly 20 restaurants in Downtown Denver have been targeted by an individual and his followers. He is demanding that they sign a letter to the Mayor’s office opposing a law passed in 2012, or else they will be boycotted and will experience protests in front of their business. We recognize the very important right to protest and welcome public discourse, but expecting to sway public opinion through harassment of local businesses is outrageous. Customers are being intimidated to prevent them from entering the restaurant and employees are concerned for their safety when showing up to work. This activity is solely about intimidation. They are attacking individual businesses that have never taken a political stance on an issue and forcing them to take certain action in order to avoid damaging their business. This behavior is not acceptable. We are working with the Downtown Denver Partnership, the City of Denver and the Denver Police Department to help restaurants deal with these destructive events and to help document the activities to help build a case against the organizers. If you have any questions about this, please do not hesitate to contact our office. We will be communicating directly with affected restaurants to support them. 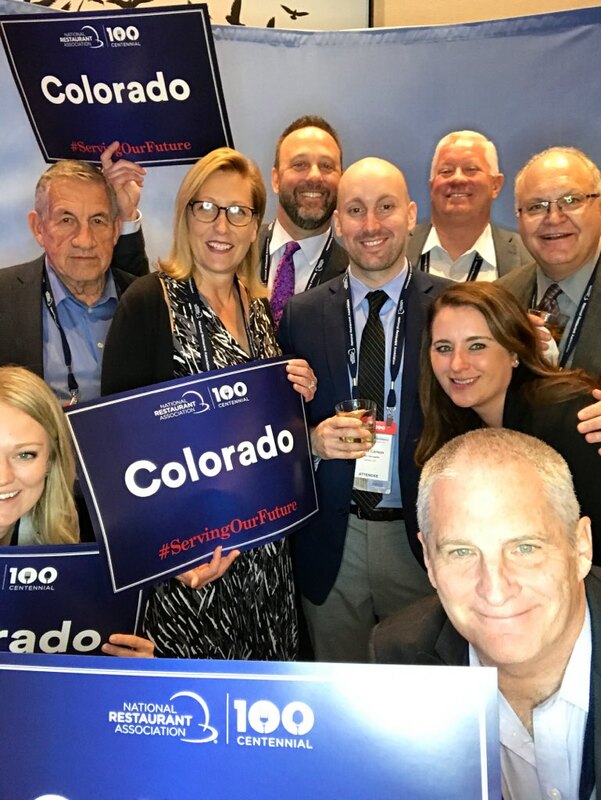 Last week, a contingent of Colorado restaurateurs joined nearly 600 attendees from around the nation at the National Restaurant Association Public Affairs Conference in Washington, D.C. to discuss important policies impacting our industry with representatives in Congress. Not only did this give us an opportunity to share local insights into ways to improve the restaurant industry — we were able to speak with Senator Cory Gardner, along with Congressmen Tipton, Lamborn, Buck, Crow, and the staffs of Senator Bennet Representative Neguse, and Representative DeGette about the importance of local restaurants to communities, and how restaurants provide fundamental skills for careers and lives. We discussed policy agendas for immigration, minimum wage, the tip credit, QIP restaurant depreciation, and ways that legislators can support businesses. The CRA appreciated Cory Gardner’s comments as a keynote speaker at the conference and his continued support for restaurants in Colorado and across the country. This conference reinforced the support that restaurants need from lawmakers for small business growth, for continuing to provide positive experiences for all customers and for creating brighter futures for employees. We are busy behind the scenes at the state capitol working diligently to mitigate some of the impacts proposed bills will have on your businesses. Things are moving very quickly on some of these issues. Don’t forget that as bills work their way through the process we send out alerts to members asking you to reach out to your elected officials. We’ve heard already from several people that our member’s efforts have been noticed. More info coming soon on many of these issues. If you have any questions or would like to know more about what we are working on, please contact Nick Hoover. The Colorado Restaurant Foundation sends out a big THANK YOU to Red Robin for hosting, Adams City High School, the winners of the recently held CO ProStart Invitational & Sysco Denver Hospitality Cup competition at their Yummm University this past Friday. After participating in the Colorado ProStart Invitational, Red Robin judges were so impressed with the Adams City culinary and management teams they offered to provide industry feedback and support to help teams prepare for the upcoming National ProStart Invitational to be held in Washington, DC in May. Thank you so much for your mentorship! Go Team Colorado! + Want to help cheer on all the ProStart participants? Make sure you join us for the Colorado Restaurant Foundation Scholarship Gala on April 30th.